All India Majlis Ittehadul Muslimeen (AIMIM) chief Asaduddin Owaisi has warned sections of Muslim society who are in favour of out-of-court settlement of Ayodhya dispute. 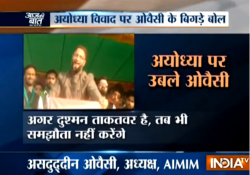 In his latest speech, Owaisi has vowed not to give a single inch of the disputed land to Hindus, and has warned Shia Central Waqf Board not to offer building of a mosque outside Ayodhya. Owaisi is a good orator. He uses logic while speaking, but this time he has questioned the Supreme Court over the Ayodhya dispute. The MIM chief said that he was waiting to see if the apex court gives its verdict “on the basis of faith or on the basis of Constitution”. This statement is objectionable. If the apex court gives its verdict in favour of Hindus, he will say the court decided on the basis of faith, and if the court decides to the contrary, he will say the court followed the Constitution. Now that both the sides have left it to the Supreme Court to decide, Owaisi’s remark has created a piquant situation. Clearly, the MIM leader is trying to polarize Indian society on the lines of religion, which is unacceptable.